Experience the fjords by boat and delve into Norwegian national culture at every stop. Discover the capital city of Oslo, with its plethora of cultural delights, and Scandinavian architecture. Spend your nights in both the quaint village of Sognefjord and the cosmopolitan city of Bergen, both surrounded by the characteristic Norwegian landscape of towering mountains and crystal-clear fjords. International flight: U.S. - Oslo, Bergen - U.S. Train journey from Mydral Station to Flam. * Airport transfers not included. Possibility to book Flybuss transfer in the next step of the booking. Flybuss operation: Passengers who arrive at Oslo airport from 9.00 am to 10.00 pm will be received by our correspondent at the destination who will give them a flybuss voucher and will accompany them to the bus stop. The passenger takes that bus and gets off at the nearest stop to the hotel. The voucher for the departure from the hotel to the airport on the last day will be given by the guide. In case the passenger arrives outside the aforementioned times, the voucher will be uploaded to the customer area on our website and will have to make the transfer on their own. Transfers in Flybuss only from and to Oslo Gardermoen airport . In case of arriving at another airport other than Oslo Gardemoen, the transfer will not be included. Drinks, entrances, tips and any other services not mentioned in what's included. 1st Day: U.S. - Night on board. Arrive at your U.S. departure airport ready to board a flight to Oslo. Night on board. Arrive in Oslo. Enjoy the forests and the beautiful Oslofjord that surround this vibrant city. Upon arrival, transfer to the hotel in the city center. Rest of the day at your leisure. Walk along the streets and explore the city of the royal family, and don't miss the main Karl Johan’s Street, with many shops, bars and cafes. Overnight stay. * Optional: Return shuttle services; from Oslo airport to the Oslo hotel and from the Bergen hotel to Bergen airport (both ways). Price per person: $39. Breakfast at the hotel. In the morning set off for a tour of this vibrant capital city. Visit Frogner Park, and the amazing sculpture park of Vigeland. At the Viking Museum, see three original Viking Age ships. Also visit the Royal Palace, City Hall and Akershus Fortress. Rest of the day at your leisure. We recommend getting a 24 hour Oslo pass that will grant you free travel to Bygdøg Peninsula and entrance to most of the city’s museums*. Overnight stay. 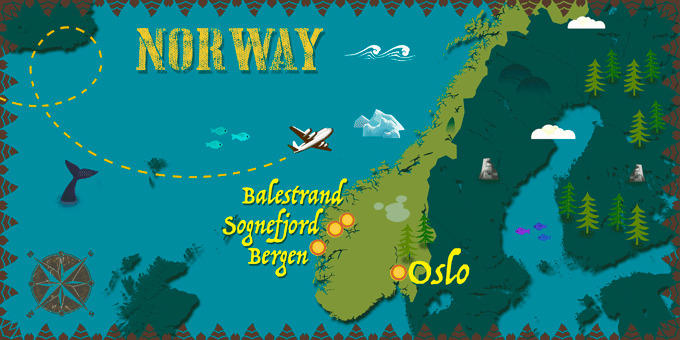 *Optional: 24 hour Oslo Pass will grant you free travel to Bygdøg Peninsula and entrance to most of the city’s museums. Price per person: $48. Breakfast at the hotel. Today, make your way to Oslo train station around 7 am for the early train to Myrdal. Myrdal station is a mountain railway station and junction, located about 8 miles from the village Flåm. Here you board the famous Flåmsbana - one of the steepest train lines in the world. The train journey runs through beautiful natural landscapes, the Rallar Road, steep mountains, breath-taking waterfalls, and through 20 tunnels. Arrive in Flåm, where you have some free time to discover this beautiful village. Continue your journey with a cruise on the Sognefjord, the longest fjord in Norway. It is considered to to be one of the most picturesque fjords in the world. Upon arrival in Balestrand make your way to the hotel for dinner and overnight stay. *Optional Full day excursion to Fjærland: Sail through the beautiful Fjærland fjord with amazing views of the steep mountains, the green fjord and vibrant landscape. Arrive at Fjærland where the glacier meets the fjord and visit the Norwegian Glacier Museum. Next explore two glaciers –Supphellebreen and Bøyabreen and return to Fjærland to take the boat back to Sognefjord. Price per person: $113. Breakfast at the hotel. Free time in the morning. In the late afternoon, embark on the fast boat destined for Bergen – the world heritage city. Bergen is the Gateway to the Fjords of Norway. As a UNESCO World Heritage City and a European City of Culture, the Bergen region has the ideal combination of nature, culture and exciting urban life all year around. Arrive and spend the rest of the day discovering Bergen at your leisure. Overnight stay. Breakfast at the hotel. Embark on a relaxing walking tour of the city of Bergen. Pass through the most amazing sights of the city such as the Hanseatic Bryggen, the Church of Mary, the Hakon fortress and the famous fish market. We recommend taking the Fløibanen Funicular, to travel to the top of the Mountain Fløyen, for an overall panoramic view of the city. Overnight stay in Bergen. Breakfast at the hotel. Enjoy your free day visiting Bergen. Overnight stay in Bergen. 9th Day: Bergen - U.S.
Breakfast at the hotel. Enjoy your last moments in Bergen at your leisure and if time allows, visit some other notable sights such as the museum of the famous composer, Edvard Greig. Self-transfer to the airport for your scheduled flight back to the U.S. Arrive back in the U.S. and end your trip. Valid passport with 6 months validity and 2 blank passport pages. No visa is required to enter the country for less than 90 days. Norway is famous for its fjords of which two, Geirangerfjord and Nærøyfjord, are included in the list of UNESCO World Heritage sites.